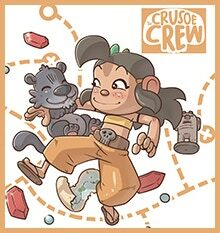 The Crusoe Crew is for 1-4 players ages 7 and up, and one adventure you won't soon forget! Hunt for Rubies, Pearls, and Statuettes in Your Own Book! In The Crusoe Crew, each player will choose one of Robinson Crusoe’s four children — each with their own special talent — and have their own book! Since your father is sick, you are going to have to be the ones to do the treasure hunting this week. You'll hunt for rubies, pearls, and valuable statuettes on one of several surrounding islands. You'll need to work together and be especially aware of hidden numbers and paths that are unique to your character! You are playing as Neta. You are very agile and able to get to places and reach things that your brothers and sisters can't! While at first glance, your book looks very much the same as the others, there is a hidden number in the frame that you can spot that the others cannot. Do you see it? You can all see the number 190 on your father's bed, but did you notice the 199 on top of the cookie jar that is sitting on the cabinet? That is only in Neta's book as he is the only one who can get to it! You would turn to that frame in your book and let your siblings know what you found! Kik, his brother, is extremely strong and has a hammer for breaking things! Sarah can speak to animals and also has a pet kitty named Purr that can discover things! Gabby is the queen of puzzles. She gets extra clues for solving them! You can play with any combination of characters and the game scales to account for it. So grab a friend, your family, or even sit down by yourself to experience all this game has to offer! The following is an example of how the game plays with multiple characters. Click on the image to see a higher resolution. and each player turns to that frame in their respective book. Track what you find and how much time has passed on the rule sheet. You'll have only 5 days to find the most treasure possible.